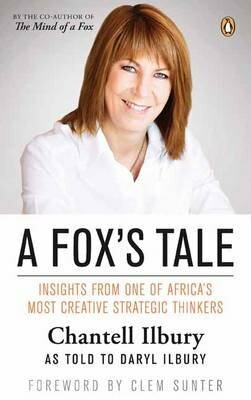 Sit down with one of Africa’s most creative strategic minds, and really get to know her and how she thinks … In this book, and for the first time, Chantell Ilbury – bestselling business author, renowned scenario strategist and speaker – tells her remarkable story. It covers her formative years in a country at war, her early days as an educator and entrepreneur, the roots of her successful partnership with Clem Sunter, and what she has learned steering the executivelevel strategies of global organisations and some of the biggest names in business. She also talks candidly about dealing with physical threat, controversy, reputational risk and the dangers of a woman travelling the world alone; and provides refreshing perspectives on entrepreneurism, working in Africa, balancing the demands of family and business, and on women in the corporate working environment. A Fox’s Tale is loaded with strategic insight, yet often reads like an adventure novel, rich with humour and entertaining anecdotes.